Thanks Ronnie for finding this and to the Davis Phinney Foundation for the article. Check out their other articles. Gathering with family and friends to share a special meal is a time-honored tradition for many around the holidays. While the effects of Parkinson’s often make meals a challenge, planning and creativity can help you make the most of your time together around the table with loved ones this season. Some of the changes Parkinson’s brings impact using utensils. These issues can be related to tremor as well as side effects of various medications. There can also be Parkinson’s-related difficulties with moving the fingers and hands, sometimes referred to as fine motor control problems. It can be helpful to switch to utensils that are easier to use. Typically, this means using flatware with handles that are a little bit larger and easier to grip. You can find specially designed utensils in medical supply stores and there are even utensils with extra wide grips that can be held in any number of different positions for ease-of-use. If you are looking for an elegant solution, consider purchasing utensils with larger handles the next time you buy flatware. While this might require shopping around, it would be worth the effort if you can find something that makes eating easier. Plates. Another helpful bit of adaptive equipment is known as a plate guard. This device slips onto a plate in order to provide an edge to push-up against when using utensils. It also prevents items from spilling out over the edge of the plate. Plate guards are available at many local medical supply stores. Again, you may also seek out items available at local houseware and department stores that can provide some of the same benefit with a little more sense of style. Cups. Use a cup with a lid to reduce the risk of spills if tipped over. This could easily be a travel mug or a plastic cup that has its own lid and straw. However, people who have swallowing problems may have trouble drinking liquids with a straw. If you have trouble drinking with a straw or swallowing in general, consult a speech language pathologist for a solution tailored to your own specific situation. Cups with very wide bases can also help avoid spilling, although sometimes these can be difficult to manage. Foam Tubing. Another simple solution is to put a small amount of foam tubing over existing utensils. These materials are also often available at medical supply stores, although you may be able to find something similar at a local hardware store (just be sure to wash these items thoroughly with soap and water before use). Consult an occupational therapist (OT) with expertise in the treatment of Parkinson’s. Occupational therapists are experts in adaptive equipment (like utensils) and may offer a number of helpful options for managing mealtimes. Sometimes you have to get creative in the kitchen. We have some food preparation adjustments and ideas that may improve your dining experience. achieved with some of the snack items that are common at holiday meals, such as crudites (like carrots and celery sticks), fruit, cheeses and olives. For a main dish, consider preparing meats that are commonly eaten with the hands, such as chicken drumsticks or ribs. Both of these can be prepared very easily using a slow cooker. 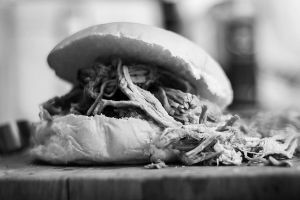 A slow cooker is also an excellent option for making pulled pork and other shredded meats. Although those are not specifically eaten by hand, they can be placed into a simple sandwich and the already shredded consistency is easy to chew and swallow. A simple sandwich or even a hamburger can be an excellent option, as well, particularly if it’s cut into quarters to make it easier to eat. Crockpot Magic. As you begin to prepare finger foods, consider a crockpot. Slow cookers produce food items that are very soft with additional moisture. As noted above, this can be particularly beneficial when cooking meat because it makes it particularly easy to eat. While you’re cooking different types of meat, you can also add in vegetables such as potatoes, carrots and other options that will be cooked at the same time to a very soft consistency. When cooked in this way, many of these items are not only easier to cut up and eat (with or without utensils), but they have the added benefit of being softer and easier to chew and swallow. Don’t Forget the Condiments. Condiments such as ketchup, mustard and mayonnaise serve a number of purposes at mealtimes. They are often used to make food more appetizing, particularly if your tastes have changed over time due to the loss of sense of smell. Condiments can also provide needed moisture and “lubrication” that can make eating and swallowing significantly more efficient. 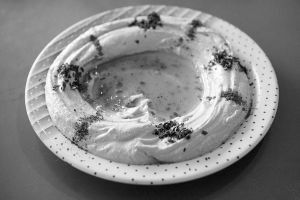 Expanding your definition of condiments to include spreads such as hummus, guacamole and various dips and sauces will add moisture, nutrients and extra calories, in addition to making food less thick and sticky. One of the ultimate condiments this time of year is gravy. Gravy can make a number of foods taste much better while simultaneously making them easier to eat. Acid reflux (aka GERD) and constipation are very common complaints with Parkinson’s. Your doctor may prescribe medications intended to address these issues. You can also help manage these issues by carefully choosing your foods. Digestion is often very slow among people Parkinson’s, so one simple change you can make is avoid eating very large meals. Break up holiday meals into shorter sessions and give yourself time to digest in between each of these sessions. Very heavy foods with significant amounts of fat can also be difficult to digest quickly. This enhances the risk of acid reflux, particularly with fried foods. Foods that are particularly acidic, such as tomatoes as well as many citrus fruits should also be limited. Finally, be sure to include a healthy amount of vegetables into each meal to provide some balance and reduce the risk of reflux. When you’re finally sitting down for your meal, take a couple moments to arrange things to make it easier for you to enjoy. If possible, avoid being in front of an open window or other light source that will “backlight” your face. Backlighting makes it difficult to see your lips and your eyes while you’re speaking and can make it harder for others to understand you, particularly if your voice has gotten softer as a symptom of Parkinson’s. If your family gathering is so large that there’s more than one table set up, try to find the environment that is quieter and less busy. Too much noise and distractions can sometimes interfere with your concentration, slowing down the process of eating. Sharing meals with family and friends is an important part of how we connect with our community. With simple changes, it’s possible to make big improvements to holiday festivities so you can spend your time enjoying your friends and family. We hope you enjoy your next meal with family and friends.